This week we will be celebrating our nation’s independence. For many of us July 4th is a day to party with friends and family as we toss those burgers and hot-dogs on the grill, fill the ice chest with beer, and stop at the corner stand and pick up some fireworks. But did you know those few actions can have a devastating effect on your dog? 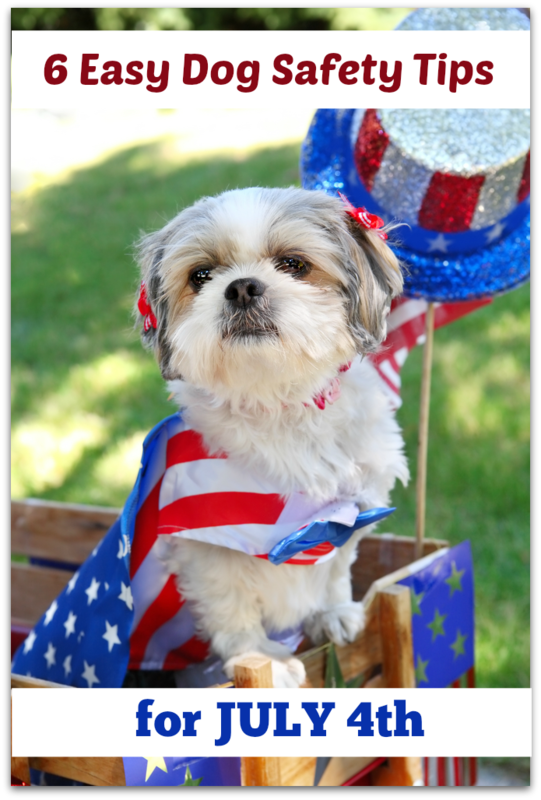 So we have collected a few dog safety tips for the 4th of July! For us this is a top priority. By keeping your pets indoors you can be sure that they wont be among the many dogs running around the streets scared from all the loud sounds that come with this holiday. Most of the Shih Tzus do well with all the banging and popping going on, except for Katie & Trixie…. I am actually dreading this day. For us these means we will pull out the Anxiety Wrap, lock ourselves in the bathroom and turn on a calming CD. The Anxiety Wrap is my wrap of choice now, as I have seen a complete difference when Katie has it on versus other well-known wraps. 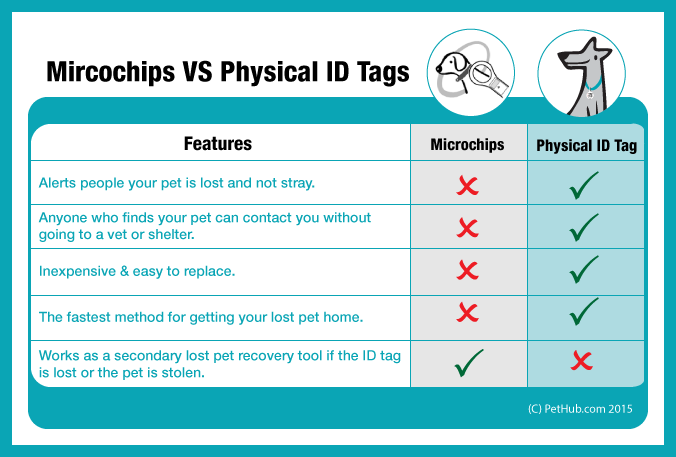 You may think, ‘Oh my pet is micro-chipped so they will be able to find me.’ But will they? When your dog was micro-chipped did you contact the company to complete the registration? If you did complete the registration have there been changes to your contact information such as a new address or new telephone number? My fear of only having a microchip is that who ever finds my dog will not take them to the vet to see if my dog is chipped, but they will take them to the shelter, and leave them there thinking I will be there within 72 hours to pick them up. But there are a lot of what ifs to that. What if my dog is turned into a shelter that is not in my area, what if I don’t make the 72 hour stray hold, what if , what if…. to me that is a scary thought. Ensure your dogs safety with a physical tag such as those from PetHub! The cool tags of PetHub have a cool QR code to help get your pet back to you, with a wide array of tag designs, there is sure to be one for your small dog fashionista! Not only can the loud bangs be scary to a dog, fireworks also contain toxic ingredients! Ingredients such as chlorates, barium salts and sulfur, along with coloring agents loaded with heavy metals. Once ingested these items can harm red blood cells, cause kidney failure and also causing seizures. So always be aware of new and used fireworks and where they are stored. It may be cute to see cousin Jim Bob give fluffy a taste of his beer, but this is far from the case. Alcohol can have seriously dangerous effects on a dogs system. Alcohol poisoning happens a lot more than you may think, so knowing the signs may save the life of your pet. These are only a few symptoms. If your pet is showing signs of being drunk immediately take your dog to the vet!!! There is always a chance for seizures, brain damage and even death. July 4th happens at almost the hottest time of the year, so just like us pets are susceptible to heat exhaustion and heat stroke. 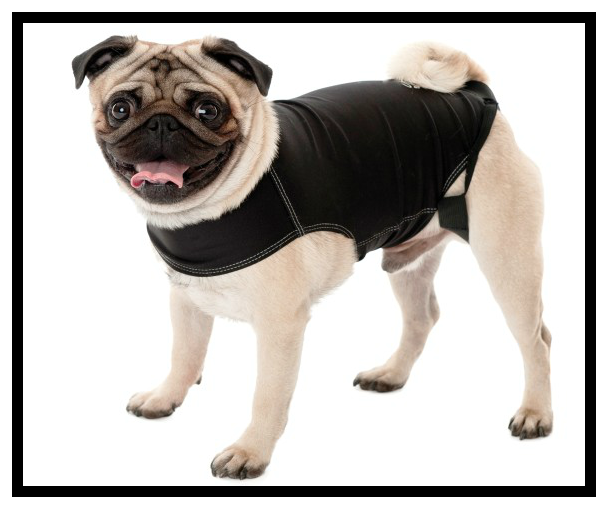 Be sure to take special precautions to keep your pet cool. 5 Ways to Keep Your Dog Cool in the Summer gives some cool tips such as misters & kiddie pools. 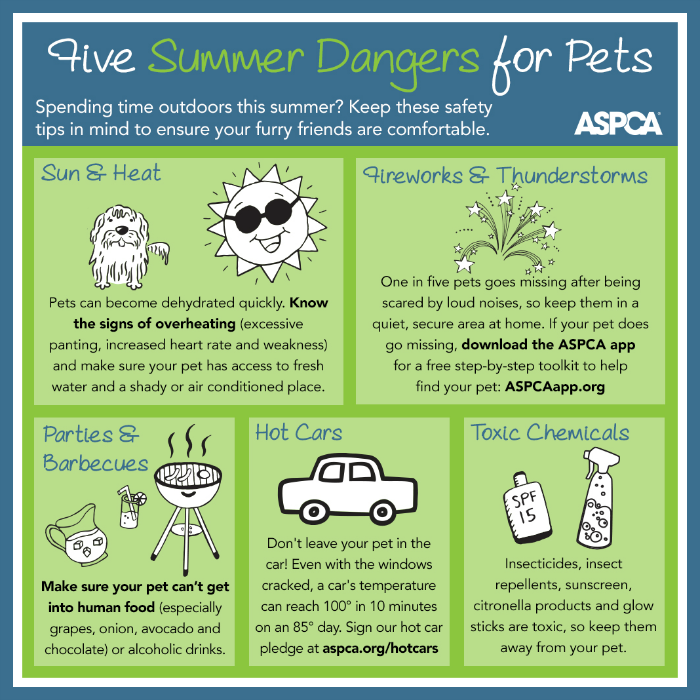 In an effort to keep your pets safe not only this weekend but throughout the summer, the ASPCA has created this cool info-graphic and is giving the readers of Oh My Shih Tzu an opportunity to win a Deluxe Pet First Aid Kit and Subaru Blanket!! So have a great 4th of July this weekend, stay safe and protect your pet and good luck in the Giveaway! If you have any additional ideas of keeping your pets safe please share with us in the comments below! Disclaimer: Anxiety Wrap provided us with a wrap for review, we were not monetarily compensated for our review or mention of their product. PetHub did not supply us with a dog tag or compensate us monetarily for mention within this post. Please know that we only share what we believe is good for your pet, and in brands you can trust. We believe in honest and truthful reviews to protect you and your family. We did not receive any monetary compensation or products from the ASPCA for mention within this post. I’m going to a bridal party! We take our dogs out for a hike and swim before the fireworks start. When my dogs are tired they don’t notice the fireworks as much. That is such an awesome idea!! Thanks Daniel! Maybe a good swim will do my girls good as it’s too hot here to go for a walk. Great prize! Thanks for the opportunity to win. My dog Valentino and I will be staying home, safe and sound, for the 4th of July. We will be joining the fun of ZoePhee’s first Blog Anniversary celebration online! We’ll be staying home and grilling this year since this is our first 4th of July with Luna. We’re hoping she fares well with the fireworks. Happy 4th! I don’t have any plans other than trying to keep the kitties calm and happy. I’d add that if your dog is afraid of fireworks, it’s best to leave him/her at home, preferably with someone there to help keep him/her calm. These are really great tips! It’s great!! A definite must have for any dog household. Perfect safety tips for this time of the year! I think Haley is finally used to the sound of firecrackers going off in the neighborhood, but she’s still happy when it’s all over. Great advice- Have a very safe 4th! It’s going to be so hot this weekend that we’re going to stay indoors and try to go for walks early. Great tips. Usually we spend the 4th in the mountains where we don’t see or hear fireworks. This year we’ll be here at the shore where the celebrations go on all weekend! Everywhere. On people’s piers. Across the river. Toward dusk I’m always on a leash. My Human gives me calming pills in case anything goes off nearby when we are outside. Hey, the only solution is to build me an indoor bathroom! Hawk aka BrownDog recently posted…Is It Mischief? Hope you have fun… it’s always nice to change things up a bit! Next year we will be in the mountains too! Your patriotic pup is beautiful! Those are great ideas, especially keeping all pets indoors when there are a lot of people running the streets with (in our area illegal) fireworks. Your patriotic pup is beautiful! Those are great ideas, especially keeping all pets indoors when there are a lot of people running the streets with fireworks. Great tips!! We will be having an early BBQ and then spending the night with the dogs trying to keep them calm. My only other tip is to schedule potty breaks around the fireworks if possible. My smaller dogs have to go out every two hrs so I make sure I take them out at 11 and than at 1 and hope the noise is limited at these times. I feel so sorry for him, but as the years before, we will keep them safe and inside. Thanks for all the great reminders. Great advice here. We intend to do all of these things. Our Little Bit hates fireworks. And a giveaway too. I’m in. I linked you to Awww Mondays and thanks for dropping by. Try to stay safe on this holiday… I’ll be locked in a bathroom with two very scared Shih Tzus. Great tips once again. Thanks! Thanks Earl & Ethel!! What are your big fireworks holidays in the UK?